Africa's leading carrier, Ethiopian Airlines, has upped the competition for the US market, with this week's announcement that it will introduce three-times-a-week flights to the John F Kennedy International Airport in New York, adding to its flights to the city's Newark International Airport. The announcement may not come as good news to the region's other airlines, which are also looking to serve the same market. This, coming barely two months after Kenya Airways started its daily direct flights to JFK Airport, and a few months before Rwandan flag carrier RwandAir launches its flights, may further upset these carriers' plans. 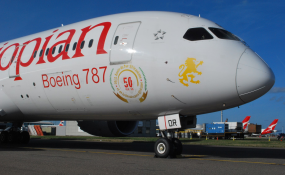 ET Group chief executive Tewolde GebreMariam said that the new move is informed by the fact that the US is among the airline's most important markets due to the presence of a large African community and growing business and tourism ties with Africa. "Our new route structure with additional frequencies to multiple gateways and the opening of new routes to Houston are in response to the market demand and will provide the best possible connectivity to over 60 African destinations," said Mr Tewolde. But the airline has cancelled its Los Angeles frequency, opting for a new gateway -- Houston -- to take advantage of the large African community in the city, its concentration of oil companies and others doing business on the continent. This route will be served three times a week via West Africa. "In line with our roadmap, we will keep on expanding our US and African network to facilitate people-to-people ties and the flow of investment, trade and tourism," Mr Tewolde said. This will offer travellers six to eight hours' time in Addis Ababa, a journey through the city's National Museum, a taste of Ethiopian coffee and souvenir shopping. It also opened a new 373-room Skylight Hotel, the largest in Ethiopia, and a new passenger terminal.